Dr. Bernhard Word Anderson, Professor Emeritus of Old Testament Theology at Princeton Theological Seminary, passed away peacefully on December 26, 2007, at age 91. A noted educator, author, and biblical scholar, Dr. Anderson is perhaps best known for his textbook, Understanding the Old Testament, which set records in sales for a book in that field and is read in translation around the world. Through his writing and teaching, Dr. Anderson was instrumental in inspiring the study of the Old Testament in America in the 20th century, and in shaping theological perspectives that remain important today. As an author, his effortless prose addresses readers personally and without scholarly pretension, a style that he also brought to lectures and sermons. Indeed, his ability as a lecturer was legendary among Princeton students and colleagues, who still wonder how Dr. Anderson managed to end each lecture on a stirring theological climax -- just as the bell would sound! Modest in the extreme, Dr. Anderson was often surprised by the feeling with which students, teachers, and churchgoers spoke about the significance of Understanding the Old Testament in their lives. A public tribute of this kind occurred as recently as 2004, when Dr. Anderson was invited to participate in a panel discussion at a well-known theological school. Dr. Anderson listened while a faculty member in New Testament, whom he had not previously met, told the story of how he stumbled on a copy of the book as a novice Cistercian monk in the Knockmealdown mountains of Ireland. Over the next six months, the professor recounted, he read it from cover to cover, as lectio divina, in the silent hours between the 3:45 wake-up call and the 6 A.M. Eucharist. Profoundly inspired in a new direction, he eventually left the monastery to pursue the historical study of the Bible and become a teacher in his own right. He added that he had told this story many times in the years since, but couldn't resist telling it again in the presence of the author himself! In another instance, a professor wryly observed that when he used Dr. Anderson's textbook in his classes, he noticed a dramatic increase in the number of Old Testament names his students gave to their children. Dr. Anderson approached people and challenges with an enthusiastic charm that owed much to the American frontier. He was the son of an itinerant Australian preacher who came to America in the early 1900's to pursue a seminary education. Born in Missouri, he moved at a young age to California, where his father ministered to small congregations in the mining district north of San Francisco. Of necessity as well as inclination, Dr. Anderson became an integral part of the worshipping community, learning early to play the organ so he could accompany hymns during his father's services. A precocious student, Dr. Anderson graduated early from high school and attended the College of the Pacific (now the University of the Pacific), where he studied music but eventually majored in religion. After graduating in 1936, he married a fellow COP student, Joyce Griswold, and began studies at the Pacific School of Reli¬gion in Berkeley, California. He received his divinity degree in 1939, and was ordained a minister of the United Methodist Church. With the encouragement of James Muilenburg, his teacher at the Pacific School of Religion, Dr. Anderson became the first of Muilenburg's students to go on to graduate studies in the Old Testament field. He and his family moved East, where he pursued graduate studies in Old Testament at Yale Divinity School in New Haven, Connecticut. He received his PH.D. from Yale University in 1945, and began his teaching career in 1946 at Colgate University in Hamilton, New York. From there he moved on to teaching positions at the University of North Carolina (1948-50) and Colgate-Rochester Divinity School in Rochester, New York (1950-54). In 1954 Dr. Anderson was invited to become Dean of the Theological School of Drew University in Madison, New Jersey, where he began his tenure as the youngest Dean in the history of that institution. During his administration, he gathered and led a distinguished faculty that included the late philosopher and Jewish theologian, Will Herberg, who became a lifelong friend and mentor. He also continued to teach as Professor of Biblical Theology. While at Drew, Dr. Anderson developed a special interest in archaeology. In 1956 he joined with the late George Ernest Wright to launch the Drew-McCormick Archaeological Expedition for the purpose of excavating the site of the ancient biblical city of Shechem. In 1963-64 he served as Annual Professor of the American School of Oriental Research (now the Albright Biblical Institute) in Jerusalem, from which base he conducted archaeological field trips into Jordan, Lebanon, Syria, Iraq, Iran, and Egypt. His son accompanied him on some of these trips, including a memorable ride on camelback to the top of Mount Sinai. He recalls his father driving fearlessly into remote desert regions where there were no marked roads, and being offered such exotic delicacies as eye of sheep as the guest of a nomadic Arab chieftan. In 1968 Dr. Anderson became Professor of Old Testament Theology at Princeton Theological Seminary, where his course on the Introduction to the Old Testament was regularly filled to overflowing. Regardless of class size, he and his wife Joyce maintained a tradition of welcoming all his students to their Mercer Street home at least once during the semester. Students were invited in small groups and the evening would begin with personal introductions, followed by lively discussion that sometimes lasted hours. The occasion would end with Dr. Anderson at the piano, accompanying the singing of hymns and popular songs. Dr. Anderson travelled widely with his family, often in connection with professional assignments such as his work in Jerusalem. Drawn by the distinguished German theologians of his time, he spent a sabbatical year in 1958-59 in Heidelberg, Germany, where he visited lectures by Gerhard von Rad. He returned to Germany for a second sabbatical 1970-71, completing a translation of Martin Noth's A History of Pentateuchal Traditions. In 1983 he was invited to teach in Australia, where he visited his father's birthplace for the first time. At the invitation of a former student, he was also lavishly honored on a trip to South Korea. He recently returned the honor by donating his library to a theological school in South Korea. During his years at Princeton, Dr. Anderson actively supported the professional development of younger colleagues, with special concern for the inclusion of women. After retiring in 1983, he continued to teach, counsel, and lecture widely. From 1984 to 1996 he served as Adjunct Professor of Old Testament Theology at the Boston University School of Theology. He taught courses at Yale Divinity School, Union Seminary, and Middlebury College, and led numerous bible study groups both in the United States and abroad. In retirement, as in his professional life, Dr. Anderson was an ardent trailblazer and bridge-builder. He typically spent part of each day forging trails through the woods on the steep hillsides surrounding his New England home. These trails were elaborately engineered with bridges and graceful loopbacks, always wide enough for the lawn tractor and trailer that carried his tools. The easiest of these trails he called "The Path of Least Resistance." Dr. Anderson served as President of the Society of BiblicaI Literature (1980) and President of the American Theological Society (1985), and is the recipient of many honorary degrees and awards. In 1980 the Society of Biblical Literature presented him with the Julian Morgenstern Award "in recognition of his unusual success in sharing the results of biblical scholarship with a very wide audience." 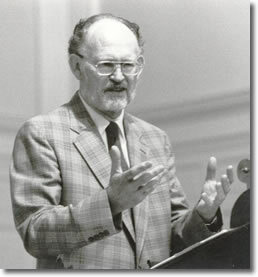 A festschrift, Understanding the Word, was published in his honor in 1985. In addition to Understanding the Old Testament, now in its fifth edition (2006), his books include Out of the Depths: The PsaIms Speak for Us Today, Creation and the Old Testament, Contours of Old Testament Theology, and a popular study guide, The Unfolding Drama of the Bible (fourth edition, 2006). Dr. Anderson is survived by his first wife Joyce, his wife Monique, his children Carol, Joan, Ronald, and Ruth, and six grandchildren. Plans for a memorial service to be held in the Miller Chapel of the Princeton Theological School will be announced later this month.